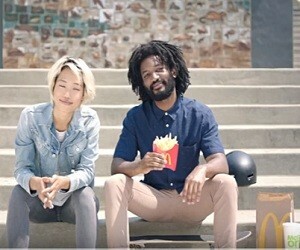 McDonald’s has released a new commercial, titled “Our Declaration”, to renew their commitment with food you feel good about. “You can learn a lot from both fans and critics. If it’s important to all of you, it’s important to us. So we’re renewing out commitment. We’re doing it for modern moms, who want the very best, discerning dads who like to keep things real, and all those parents who have a fresh perspective on parenting. We’re listening to the lovers of meet, who know how they like their beef, the lovers of things green and leafy, and golden and crispy. We haven’t forgotten our loyal fans, who like to keep things fresh. We’re following our newest followers, who always have the plan in their mind, and the ones with an eye towards the future because they are the future. And most importantly, we’re getting better together. It starts with the passion for our food and the simple belief: the simpler, the better”. The 60-second spot features, in support of the voiceover’s statement, the milk jug (with milk from cows not treated with rbST – an artificial growth hormone, Chicken McNuggets (made with 100% white meat chicken, with no artificial preservatives, flavors or colors), fresh fruit (59 million California grown clementines served), 100% pure beef (with no preservatives, fillers or additives), spinach, kale, romaine & red leaf lettuce put in their salads, and the world famous fries (with zero grams trans fat per serving), a fresh cracked egg (put in every Egg cMuffin), a Wild Caught Alaskan Pollock (sustainably sourced), and cage-free eggs (about which they say they will be completed by 2025).